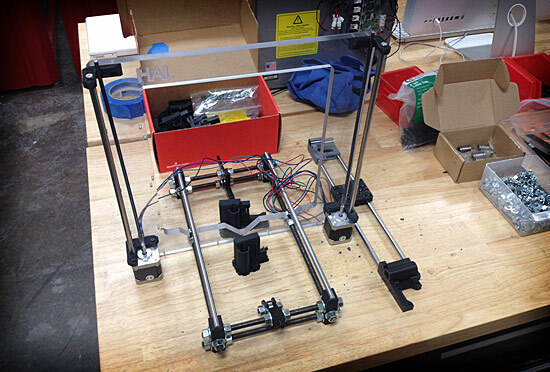 We’re making good progress on our RepRap Prusa i3 in our Machines that Make class at UWM. We cut the Lexan frames on the large CNC router after we wrote the G-code in RhinoCam. There was an engraving, and then one inside cut, one outside cut, and some center drill spots we marked before drilling the holes on the drill press and then tapping them for 3mm screws. We also cut all the threaded and smooth rods on the horizontal bandsaw and then cleaned them all up on the belt sander. I learned a few new tricks for cutting threaded rod as well. I’m a bit tempted to rebuild my Prusa i2 as a (laser-cut) Prusa i3, or maybe just build a second printer. I’d like to have a 1.75mm machine at some point instead of just 3mm so I can experiment with more filaments. I’ve also been working on a few new machine design ideas, one will be a drawing machine, and another is a platform for building CNC machines that trade in precision for low-cost. More on those in future posts. Posted on Tuesday, March 10th, 2015 at 5:22 pm. Subscribe to the comments feed. Both comments and pings are currently closed. Post on your own blog.